Fall Out Boy’s latest album cover for MANIA. Courtesy of ISLAND RECORDS. The album features the fundamentals that longtime fans have come to expect from the group, including bassist Pete Wentz’s poignant lyricism and lead vocalist Patrick Stump’s acclaimed vocal performances. And despite the modern flair, the group manages to still sound like a true band thanks to drummer Andy Hurley and lead guitarist Joe Trohman, a transition made less smoothly by bigger acts like Maroon 5. Though the lead single “Young & Menace” proved polarizing among critics, the key tracks are found on the track listing, as opposed to the major releases. “Stay Frosty Royal Milk Tea,” the song that 2015’s release “American Beauty/American Psycho” threatened, but never quite reached, is one of the group’s best post-hiatus tracks. The first half of the album has been almost universally declared as the weaker half, containing the cod reggae track “Hold Me Tight Or Don’t,” a song which parallels their previous releases “Centuries” in terms of trend-hopping, but contains too strong of a reggae push to work for a group like Fall Out Boy. Two tracks parallel one another on the album’s second half, those being “Heaven’s Gate” and “Church,” which stray away from the dance beats and flashing lights, instead playing on some of the groups more subdued tracks while containing some of the albums strongest imagery, a virtue that Wentz has brought onto the bulk of Fall Out Boy releases. 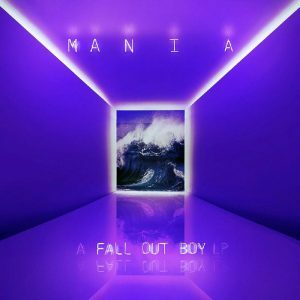 The most divisive element of “MANIA” stems from the common issue that many had with the group in their early days, that being of their overtly ‘emo’ lyricism and sounds. When mixed with a modern synthesized sound and a dancehall beat, these lyrics only become more glaring. Case in point: Stump singing “I’ll stop wearing black when they make a darker color” over a dancehall backing fit for a Panic! At The Disco b-side much better than a Fall Out Boy album. This lyricism, however, is what made Fall Out Boy stand out in 2005, and it’s what still helps the group stand out in the current rock scene, even without the excessively long titles or punching guitars. The personality behind Fall Out Boy, something that’s made them a far more accessible group than others in their field, is not lost in a sea of tropical beats. For this reason, some of the harder-to-forgive choices on singles like “Young and Menace” are easier to swallow when accompanied with Stump’s vocal stylings and Wentz’s clever lines—long-term fans of the group will be capable of seeing past the album’s weaker moments in order to indulge in some nostalgia, while still experiencing a new sound for the group.